Since I've become so open with my childhood and the family secret, I am often asked why all the stuff in the house was so bad. It's easy to look at a pile of boxes and bags sliding down atop the boxes filled with craft supplies and books, and not understand why this was so difficult. Very simply, it's not about the STUFF. Research indicates that almost all those who suffer with hoarding compulsions have another issue--mental illness, or brain injury. 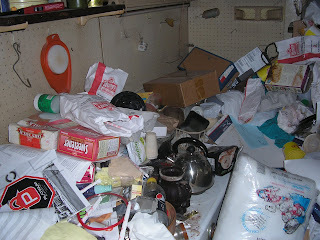 Hoarding is not THE issue; it's a physically manifested symptom of an internal problem. Flashback Week: "Where there's smoke there must be fire"
I wrote this back in mid-2010, "Where there's smoke there must be fire", but thought that since I have picked up new readership, it might be worth it to share it again. Please, just take a moment to drop even an anonymous comment so that I know you're out there...Blessings today!